The competition artists for the 15TH Annual Plein Air Easton Competition & Arts Festival have been announced. During this weeklong outdoor art festival, scores of painters, collectors, and art enthusiasts descend on Easton and Talbot County, bringing their own flavor of excitement and spontaneity that surrounds art created en plein air (French for “in the open air”). The event has become recognized as one of the largest and most prestigious Plein Air events in the world. 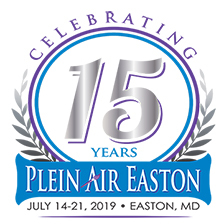 Plein Air Easton, the largest and most prestigious plein air festival in the nation, just completed its most successful year since its inception 14 years ago. It is widely recognized that a huge part of that success is a result of strong community support for the event and remarkably diverse partnerships among the event’s producer, the Avalon Foundation, Friends of Plein Air and a myriad of local organizations. This support, rooted in a deep sense of place, has enabled the event to continue to grow and expand year after year. Read more about Video - How Can I Qualify? Video - What is Plein Air? Read more about Video - What is Plein Air? Call to Artists...14th Annual Local Color Art Show & Sale Deadline March 9th! Read more about Call to Artists...14th Annual Local Color Art Show & Sale Deadline March 9th!